Please e-mail ​hornetsmoney@gmail.com to check your student account balance. This fundraiser is open to all band students in grades 6-12. Students earn money for their Student Accounts to go towards any upcoming trips and band camp. Students in grades 6-8 MUST have a parent attend with them. This is a fundraiser we start shortly after school. Students $10 for their Student Accounts for every book they sell after the first two. Each purchase of the Coupon Books includes the book and a code for their phone app unlocking many more savings. Just a reminder that all coupon books and collection envelopes are due to Ms. Kelsey or Mr. Weeks. Please remember you must turn in the sample coupon book or $25 to cover the cost of the book. We are currently seeking donations for our Evening of Jazz auction, which will be held March 22, 2019. If you have a special talent, happen to be out at a good restaurant, own a business or know someone who does, it would be greatly appreciated if you would ask if there is anything they would be willing to donate for our auction. Use your imagination! Approximately 15 more adults are needed to assist with the Middle School Party in February 2017. This party is a fund raiser for the Band Boosters. Donations of cans of Mt. Dew, Coca Cola, Orange, or Sprite are welcome, too. 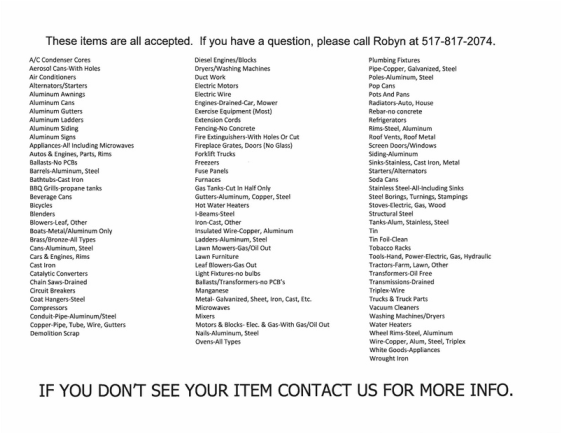 Here is a list of the accepted items for the scrap metal drive. Interested in contributing to the Williamston bands? Please see the PDF below to learn how to become a sponsor.